This is a heavy duty cotton muslin bag with a double drawstring. Put your bar of soap in it, or fill it with soap shreds or chunks or even leftover pieces of bars that are almost gone and use it like a washcloth for bathing. 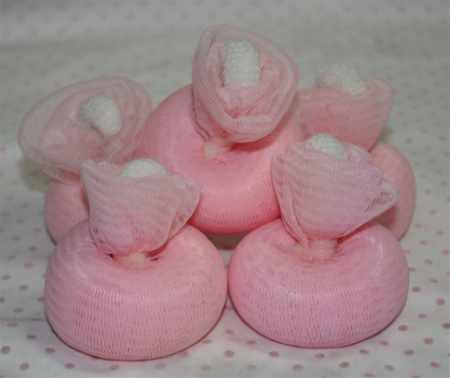 These are great for use with soap balls too! Perfect for children's little hands, helps them hold onto the soap. Just drop in the soap, tie the drawstring, and use over and over! Great for camping or at the gym! Wonderful little organza soap bag with satin ribbons. Hang your soap in the shower, let it drip dry ... grab it and soap up, hang it back up! So neat! What to do with the little soap slivers when your bar is almost gone? Put them in the soap bag! So easy to use, feels good on your skin, too. And it's very pretty! 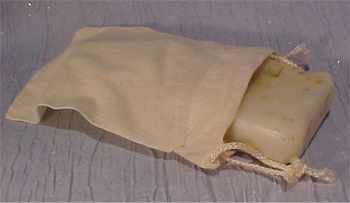 Your soap will last longer as it dries quickly inside the bag. These bags are very well made and are substantial, not flimsy like many on the market today. The mesh is gently exfoliating, resulting in smooth skin! Use indoors or outdoors, many keep one hanging near the faucet to use during gardening. Perfect for using up soap ends or soap scraps instead of tossing them out. Excellent for scrubbing skin and nails after working outside. My grandmother taught me that you can't get really clean without using a washcloth ... another bit of excellent advice. I keep a stack of the cloths in each bathroom. Our Hand Knit Washcloths are made from 100% pure cotton and are a great complement to our handmade soaps and bath indulgences. The approx. 9"x9" cloth provides a gentle exfoliating effect. Machine wash and tumble dry low, they just keep getting softer. To use, insert your finger into the terry cloth loop, hold the sponge in the palm of your hand, wet the sponge, rub on your favorite soap, then gently rub in a circular motion on your face and neck. The sponge gently exfoliates dead skin cells and can also be used dry to help exfoliate. After use, just rinse and either hang or place on a dry washcloth to air dry. 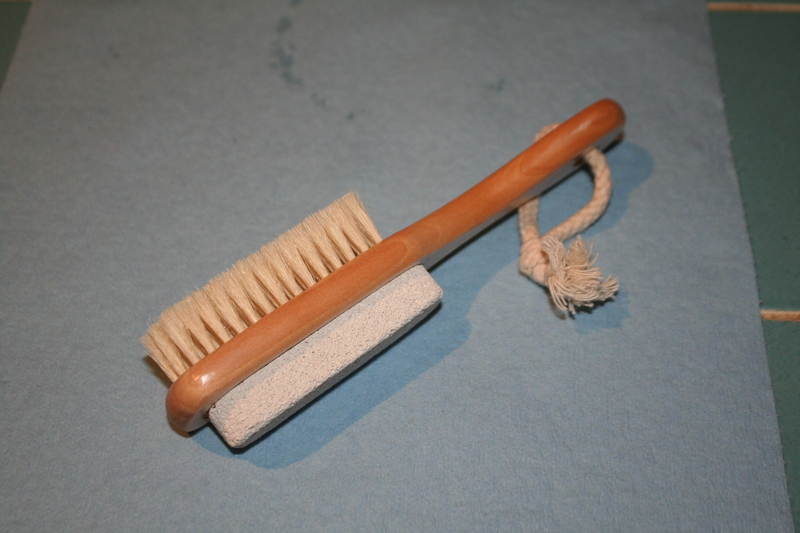 This pumice bristle combo brush is an attractive and practical foot tool to add to any skin care or home spa basket. Combine it with a cooling body scrub for invigorating the feet. 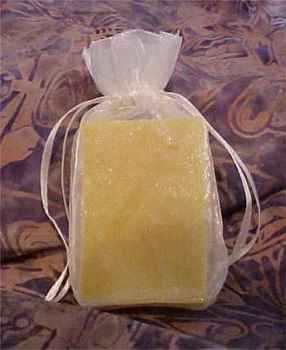 To help extend the life of your handmade soap, please keep it dry between uses, away from water. This wooden soap dish drains very well and works perfectly for this purpose. It's also easy to clean. 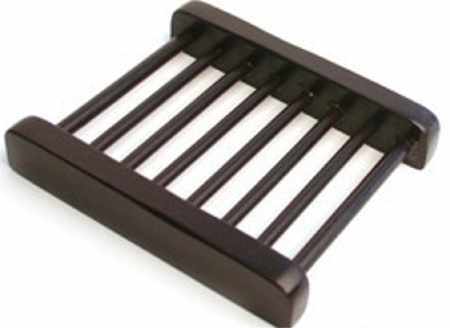 Clear plastic ladder style soap saver to use alone or inside a dish. The best way to keep your soap dry. Increase the life of your soap by sitting it on a Soap Saver, it will have ample air circulation to increase the life of the soap. This is a hard-to-find solid crate. When they're gone I don't think I'll be able to get more. All I find now is slatted, which I don't think is substantial. 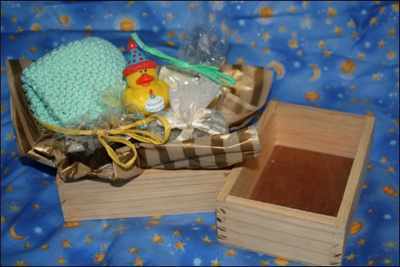 Holds 4 bars of soap or 3 bars with washcloth or other soap accessory. I'd be happy to wrap a festive gift for you to send or keep. Approx. 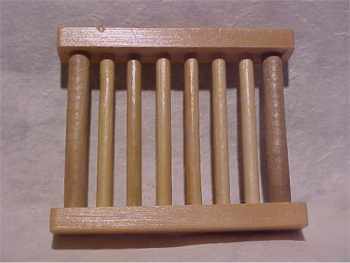 5-3/4" x 2" x 4"